Philip Norton, a Conservative life peer and a Professor of Government at the University of Hull, provides his synopsis of the Fixed-Term Parliaments Act and why the Prime Minister of the UK no longer “calls” a snap election. Incidentally, if our Senators were all even half as qualified as Norton, our upper chamber would be in much better shape today. The Prime Minister has announced she will be asking the House of Commons tomorrow to vote for the motion ‘That there shall be an early parliamentary general election’. She correctly stated the provisions of the Act. She is thus ‘calling for’ an election, not ‘calling’ an election. The decision now rests with the House of Commons. 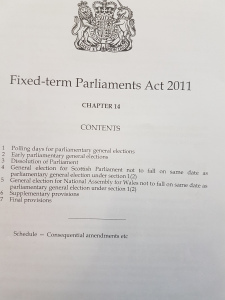 A two-thirds majority of all MPs is required for the motion to be passed. That majority is expected to be achieved, given that Jeremy Corbyn has said Labour will vote for it. Indeed, he made it clear some time ago that he would support an early election, thus doubtless aiding the PM in her consideration of whether to seek an election under section 2(2) of the Act. This entry was posted in Dissolution, Electoral Reform. Bookmark the permalink. Thanks to you, we now understand the British dissolution process! But I think you shouldn’t throw the Senate into this discussion. If you remove all the hacks that Harper appointed and some of the earlier Liberal hacks, you are left with a pretty impressive group. Of course, they are having trouble sorting out their new life!